This one is sort of the twin of episode 12 in that it adopts a certain movie style in an effort to disguise the fact that nothing of note actually happens. It's also reminds us of the Digimon introduced in the previous episode. This time, at least, the world seems to be built to showcase this new Digimon, instead of having Raidramon randomly romping through the Wild West. There's no reason given for the digidestined to even be in a section modeled after samurai-era Japan. Ken is absolutely tear-assing through the Digital World, quickly re-claiming more than half of the territories. In spite of this, the only reason the digidestined go in at all is because Yolei was bored and annoyed at her brother. Their deployment strategy could use a little bit of work. This area is visually neat and we get a better chance to appreciate the old-school Japanese look than we did with the Wild West as the team is seemingly alone in the village. They don't even pretend to fall for that and are practically expecting the inevitable ambush from wave after wave of evil flunkies. The ensuing five-on-hundred battle gives the Rookies a rare chance to strut their stuff. 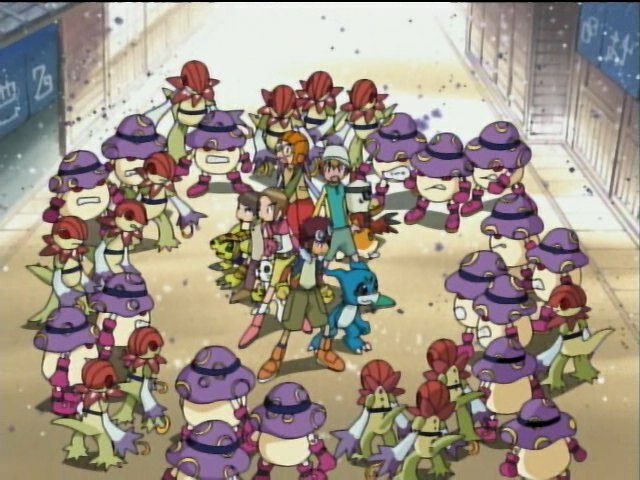 In particular, Veemon finally puts his headbutt to good use as he barrels through the crowd while Gatomon (who always seems to get slotted as a Rookie) pulls out a sweet hypnosis spell on an unsuspecting Floramon. Hawkmon and Yolei, however, find themselves squaring off against Ninjamon. Guess what he's all about. Yolei seems to treat this scene like a samurai movie, extolling Shurimon's abilities before even summoning him. After she does, it's an even fight, called off only because the enemy's numbers are too great and the others retreat into the sewer. 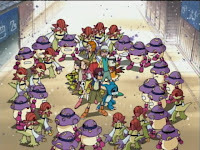 They find the Gekomon yet again, hiding underground to avoid another round of enslavement. 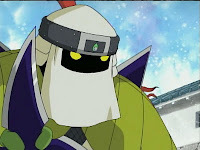 Shogungekomon is back as well, but he's still kind of drowsy and not all that useful. He becomes a problem when Ninjamon slips a dark spiral on him, turning him into a giant monster who smashes up the town. 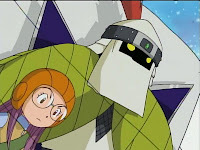 While most of the group deals with him, Yolei and Hawkmon have to deal with the whole samurai/ninja movie bit again. Ninjamon shoots a shuriken at them with a challenge message. How do Shurimon and Yolei get there? Kite. Yes, they travel by kite. Let the honorable battle commence! They may be getting all the cool scenes, but TK and Kari are actually handling the most significant problem. TK lures Shogungekomon into hitting and destroying the control spire with an attack, a move that TK gets a lot of credit for orchestrating despite the team using it several times before. This frees the flunkies, but the Shurimon/Ninjamon battle wages on. Actually, it only lasts another minute. Shurimon wins handily and Ninjamon run off and swears revenge like a baby. They may hit all the right notes of a samurai movie, but as far as actually creating the drama of one... not even close. With her parents cackling madly at the TV and Davis playing with Demiveemon in the bathtub, Jun declares her family nuts. Because she's totally right in the head and not some crazy groupie stalker. Looks like it's time to break out the summer wardrobes. It's nice, since their casual summer outfits match more closely with clothes people actually wear in real life. Shame they can't bring them to the Digital World. So now Yolei's fangirling over Shurimon. For a second, I thought that was going to be the point of the episode- not getting carried away with your studly new samurai-mon. Instead we just have Shurimon feeling really awkward about his partner's affections. Funny how the others constantly ganging up on Davis alternates between totally justified and completely unfair. It's back in unfair territory, as they all act totally horrified when he makes a harmless joke about Shogungekomon's hair, then crack up when he starts to get worried about it.